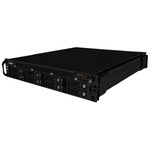 The CT-8000RP is a great all-in-one product in the world of Video Recorders. It acts as a Management Server, Recording Server, and Metadata Server all at once. The Linux-based OS brings both stability and security to the CT-8000RP. This recorder has support for up to 64 5-Megapixel cameras in great clarity. Some of the many features include; NUUO Image Fusion Technology, Fisheye Dewarp Technology, Panorama 360° PTZ control, and Unlimited channels of NuMatrix Video Wall (Ultimate). This is truly a great choice for any savvy consumer or business proprieter. Supports automatically scheduled backup to FTP. Also supports manual backup video of any Recording Servers. Export video or third party device data in ASF/AVI/Original AVI/ MOV; Snapshot and print video image in BMP/ JPG. Intelligent Search: Intuitive post-event motion search for suspicious areas on video and post-event 3rd party data keyword search then query related camera recording. The system can also search events and double clicking query associated recording. Multi-View: Crystal Titan can duplicate the same live view video onto multiple channels and digitally zoom in to see the details of different spots on cloned channels without losing the original live view video. Please refer to attached Manufacturer specifications for a complete list of features and specifications.